In just over a week, the day after Thanksgiving will kick off the 'official' start to holiday gift shopping. Dubbed 'Black Friday' either because it is usually the day most business budgets move from the red into the black, or the meaning that most men would subscribe to of its negative impact on getting around the city that day. To us men it is a black, as in sad, day if we are forced to participate in the chaos of a large portion of the US off of work and out at every mall and store filling them to the bursting with lines of insane shoppers looking for that special deal or wanting to get that special gift before it sells out. But there are better ways to shop, Well-Met ways that address the needs of men as well as those of others. If you wait just one day to shop, you can have a much better experience. 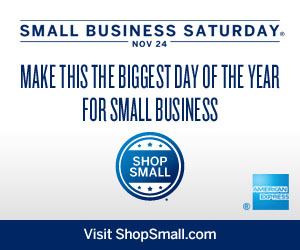 The Saturday after Thanksgiving and day after Black Friday, a new tradition has started, Small Business Saturday ® – the day dedicated to supporting local, small businesses nationwide. Check out our list of local businesses that cater to men to shop for yourself or your male family and friends and let us know if we are missing any to add to the list. For a full list of small businesses to support in Milwaukee, or any area, plug in your zip code here. That same day you can also go to Art vs Craft, an annual fair in Milwaukee that brings together a diverse range of makers who sell their handmade goods direct to the public. And yes they do have man-friendly products there - a review of last year's event from the Well-Met angle is here. Small Business Saturday and local shopping is great, but you still have to get up and go to the store. Many men prefer to avoid them altogether and shop online as much as possible. I get it. While you are at it though, why not try to shop responsibly? Look for products that promote the Well-Met maxim of socially responsible. You can still get local products even if not at a store, you should at least look for American-made gifts to amp up the economy if not state or even more local. Here is a guide to American made products, and another online store solely of Made in America products including an entire section of clothes For Him, or us as it were. Our Goods & Services page also lists stores with 'green' environmental business practices, but don't stop there since we focus on man-friendly products for you - look for other eco-friendly products in store and online. I know if my family could afford for my wife to give me a red-bow car like in the commercials, I'd prefer a Tesla. There are also many ways to get and give at the same time. Some are listed on the Shop and Share section of our Goods & Services page. 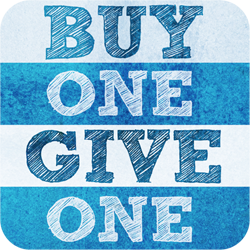 It's a new form of BOGO - instead of buy-one-get-one (which most of the time is get-one-half-off so really BOGOHO), it's buy-one-give-one - or B1G1 versus BOGO - where for every item you buy a similar one is given to those in need from shoes to blankets and all other manner of products, just search for 'buy one give one' in your browser to find like minded businesses. There are also ways to shop that donate money when you buy products like the famous (RED) campaign most well known for GAP products or you can install a Chrome or Firefox browser plug-in called CauseCart that works with ecommerce websites to donate a portion of every user’s online purchases to charity - a better description can be found here. Register at sites like iGive and you can shop at stores like Barnes & Noble and Amazon and give back to a cause you support. Your favorite non-profit may have a way from their web site to link out to other sites where if you shop you give back to that charity. There are so many opportunities out there, one just needs to look for them. Hands down the easiest, and maybe best, gift to give is just making a donation in the recipient's name. Pick a charity that aligns with one of their passions and make a donation. No shopping, no wrapping, and you will give the most directly to that cause. They love cats - donate to a local shelter or rescue, they have family or friends affected by a health issue- donate to it's charity, and so on. Buy a card, print or write a little note, and BAM you are done. They may say it's not the gift that matters, meaning it is the act of giving, but we say the gift can matter. It may take a little time - stress little - to find a way to use one of the strategies above, but when you are already cutting corners as a man, doing a little bit more to give a gift that gives beyond the recipient can mean a lot to those that benefit. In the end you can make the gift more meaningful and appreciated, by the recipient of the gift and those that benefit from it's purchase. This year, skip Black Friday as usual, but make your holiday shopping starting the day after be a gift in the giving.